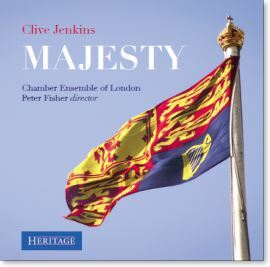 Majesty - by Clive Jenkins, CEOL's latest recording, is now out from Heritage Records. It is available as a download from Amazon and iTunes. Clive wrote the piece for a CEOL concert at the V & A to go with an exhibition of photographs of the royal family. Since then, it has been played as the Queen herself led members of the royal family and Knights of the Garter into the Waterloo Chamber at a function in Windsor Castle. 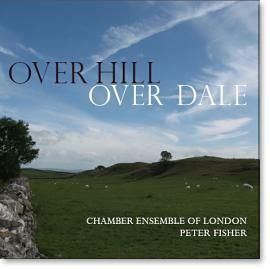 This double CD was launched at the English Music Festival on 25th May. 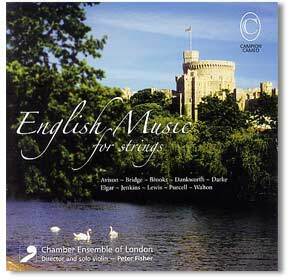 EMRCD032 is a reprint of CEOL's 2006 disc 'English Music for Strings'. EMRCD033 is all new. Premiere recordings are marked with an asterisk. The CD is dedicated to Frances Andrade (1948-2013), a much-loved member of the Ensemble greatly missed. 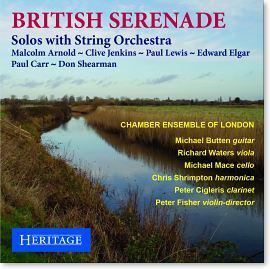 "This beautiful collection of English string music features some real discoveries. Classic FM Drive Featured Album, 8 July 2013. The Chamber Ensemble of London is developing quite a reputation for discovering and championing little-known or lost repertoire for string orchestras. Their latest album ranges across the centuries - from Purcell to the present day - to uncover exquisite lost works, including some by towering figures of English music. Harold Darke's Fantasy in E major for String Orchestra gets a memorable world premiere recording, as does Giles Farnaby's Seven Pieces for String Orchestra. Elgar's tender Elegy for Strings was likely written by the composer on hearing of the death of his great champion, August Jaeger who he had already immortalised as 'Nimrod' in the Enigma Variations. Sir Malcolm Arnold's Concerto for Two Violins and String Orchestra features the Ensemble's director Peter Fisher and Maya Iwabuchi. A beautifully recorded and performed album with something new for all listeners." "This is a most enjoyable recital of some generally unfamiliar English string music. The Darke Fantasy is a real discovery. " The recorded sound is beautifully resonant and well balanced. 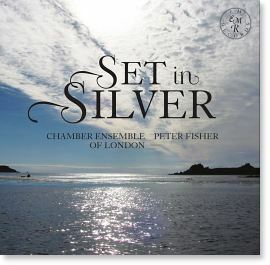 Soloists: Peter Fisher and Maya Iwabuchi (violins) and Peter Adams (cello). This is a brilliant CD with a well-balanced programme. The contemporary works are not, as so often, makeweights. In fact the most impressive piece is the Dankworth and the most moving the Brooks. This recording is a fine introduction to the glories of British, or more precisely. English string music. Each and every piece on this CD (...) should be in the repertoire of orchestras and ensembles the length and breadth of this country - if not the Classical World.